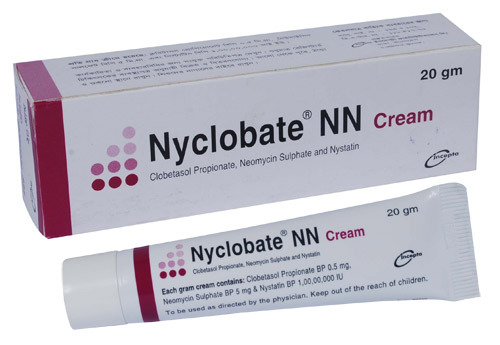 Nyclobate NN Cream: Each gram cream contains Clobetasol Propionate BP 0.5 mg (0.05% w/w), Neomycin Sulphate BP 5 mg (0.5% w/w) and Nystatin BP 1,00,000 IU. Clobetasol Propionate is a highly active corticosteroid with topical anti-inflammatory activity. The major effect of Clobetasol Propionate on skin is a non-specific anti-inflammatory response, partially due to vasoconstriction and decrease in collagen synthesis. Neomycin Sulphate is a broad spectrum antibiotic of the aminoglycoside type and is used to treat infections with bacteria. 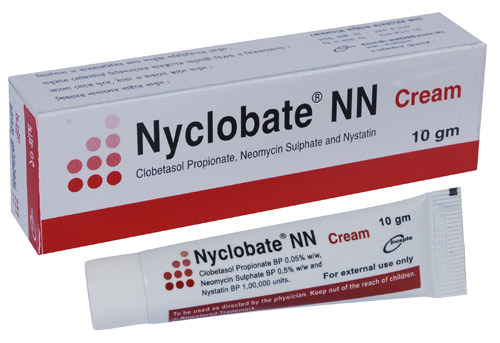 Nystatin is an antifungal medicine that kills fungi and yeasts by interfering with their cell membranes. The principle action of the preparation is based on the anti-inflammatory activity of the corticosteroid. The broad spectrum antibacterial and anti-candidal activity provided by the combination of Neomycin and Nystatin allow this effect to be utilized in the treatment of conditions which are or are likely to become infected. Any inflammatory skin disorders like eczema & psoriasis where secondary bacterial or fungal infection is present, suspected or likely to occur. • Apply sparingly to the affected area once or twice daily until improvement occurs. As with other highly active topical steroid preparations therapy should be discontinued when control is achieved. • In very resistant lesions, especially where there is hyperkeratosis, the anti-inflammatory effect of this preparaton can be enhanced, if necessary, by occluding the treatment area with polythene. • Treatment should not be continued for more than 7 days without medical supervision. If a longer course is necessary, it is recommended that treatment should not be continued for more than 4 weeks without the patient's condition being reviewed. Elderly: This preparation is suitable for use in the elderly. Caution should be exercised in cases where a decrease in renal function exists and significant systemic absorption of Neomycin Sulphate may occur. Children: Under 2 years this preparation is not recommended. Long-term continuous topical therapy should be avoided where possible, particularly in infants and children, as adrenal suppression can occur readily even without occlusion. If used in childhood, or on the face, courses should be limited to 5 days and occlusion should not be used. If applied to the eyelids, care is needed to ensure that the preparation does not enter the eye. If used in psoriasis careful patient supervision is important. Scalp Application: Keep away from eye. Flammable. Do not use or dry the hair near a fire or flame.